Die Mercurii, 16° Martii 1831. Humphrys v. Pratt, in Error. Cooke et al. v. Bp. Elphin, & Lloyd, in Error. Bp. Worcester takes the Oaths. Drawback on Malt, Petitions of Maltsters in Clackmannanshire & Distillers in North Britain to continue. Tithe System, Petition from Silian for Revision of. Birmingham (St. Martin's) Burial Ground Bill. Liverpool & Preston Road Bill. Macqueen to enter into a Recog ce on Robertson's Appeal. Grand Jury Laws, (Ireland,) Petition from Mayo for Revision of. Clyne v. Sclater et al. Appellant's Petition to amend Appeal, referred to Appeal Com ee. Simson & Parrott v. Jones & Innes. Trower's Divorce Bill, Petition to dispense with Attendance of Mr. Trower. Leeds & Birstal Road Bill. Norwich & North Walsham Road Bill. Passengers in Steam Vessels, Petition of Owners of Steam Vessels plying between Leith & Stirling against proposed Tax on. Malt Duty, Petitions from Goudhurst & Aylesford for Repeal of. Criminal Laws, Petitions from Ashford & Charing for Revision of. Mrs. Turton's Divorce Bill, Petition respecting Service on Mr. Turton. Galway Elective Franchise, Petition from Roscom for Extension of. Com ee to appoint a Chairman. St. Mary's Hospital, Newcastle upon Tyne, Petition referred to Judges. Brown's et al. Petition referred to Judges. Orford's Petition referred to Judges. Earl Stanhope's et al. Petition referred to Judges. Sir R. Frederick's et al. Petition referred to Judges. The Lord Tenterden sat Speaker by virtue of a former Commission. Ordered, That the further Consideration of the said Cause be put off sine Die. Ordered, That the further Hearing of the said Cause be put off to Tuesday next. This Day Folliott Herbert Lord Bishop of Worcester took the Oaths, and also took and subscribed the Oath of Abjuration, pursuant to the Statutes. The House was resumed by The Lord Tenterden. Upon reading the Petition of the Maltsters for Distillery Purposes in the County of Clackmannan, whose Names are thereunto subscribed; praying their Lordships to continue the Malt Drawback, as the only Means of preventing Smuggling, and of saving the Petitioners and many Hundreds in Scotland from Ruin:"
Upon reading the Petition of the Distillers in North Britain, whose Names are thereunto subscribed; praying their Lordships "to prevent the ruinous Measure of taking off the Drawback allowed on Malt from being adopted:"
Upon reading the Petition of the Inhabitants of Chesham, in the County of Buckingham, whose Names are thereunto subscribed; praying their Lordships, "to pass the proposed Measure of Reform into a Law, as being congenial to the far greater Part of His Majesty's loyal Subjects, and eminently adapted to promote the Peace and Happiness of our Country, and the Durability of our Constitution, as consisting of King, Lords and Commons:"
Upon reading the Petition of the Inhabitants of the Parishes of Tullowcreen, Old-Leighlin, Killenane and Wells, County of Carlow, Ireland, whose Names are thereunto subscribed; praying their Lordships "to put the aggrieved and much-wronged People in Possession of their undoubted Rights, by granting a radical Reform, with Vote by Ballot; for any Reform, however extensive, in which Vote by Ballot is not introduced, must prove unsatisfactory and of no Avail:"
And also, Upon reading the Petition of the Inhabitants of the Borough of Marlborough, in the County of Wilts, and its Vicinity, whose Names are thereunto subscribed; severally praying their Lordships, "That the Plan of Reform proposed by His Majesty's Ministers may pass into a Law:"
Upon reading the Petition of the Owners and Occupiers of Land in the Parish of Silian, in the County of Cardigan, whose Names are thereunto subscribed; praying, "That their Lordships will, at as early a Period in this Session of Parliament as the Business of the Nation will allow, take into their most serious Consideration the present State of the Tithe Laws, and the Effects now resulting from them, and the Changes which have occurred since they were framed; and after a strict and mature Investigation of the Question in all its relative Bearings, their Lordships will be pleased to adopt such Measures and to make such Arrangements as shall appear to them to be consistent with Justice to the Payers and Receivers of Tithes, and most beneficial to the Interests of Religion and those of the Community at large:"
With a Bill, intituled, "An Act to amend an Act of the Forty-seventh Year of King George the Third, for enlarging the Churchyard belonging to the Parish of Saint Martin, in the Town of Birmingham, in the County of Warwick, and for providing an additional Cemetery or Burial Ground for the Use of the said Parish;" to which they desire the Concurrence of this House. With a Bill, intituled, "An Act for more effectually repairing and improving the Road from Liverpool to Preston, in the County Palatine of Lancaster;" to which they desire the Concurrence of this House. With a Bill, intituled, "An Act for the better assessing and recovering of the Rates for the Relief of the Poor, and of the Ecclesiastical or Church Rates, upon small Tenements within the Parish of Liverpool, in the County Palatine of Lancaster;" to which they desire the Concurrence of this House. With a Bill, intituled, "An Act for more effectually repairing and improving the Roads from Lemsford Mills, in the Parish of Bishop's Hatfield, through Welwyn and Stevenage, to Hitchin, and from Welwyn, through Codicot, to Hitchin aforesaid, all in the County of Hertford;" to which they desire the Concurrence of this House. The said Four Bills were, severally, read the First Time. Hodie 3a vice lecta est Billa, intituled "An Act to extend the Provisions of an Act of the Fifty-fifth Year of the Reign of King George the Third, to provide for the taking an Account of the Population of Ireland, and for ascertaining the Increase or Diminution thereof." Hodie 3a vice lecta est Billa, intituled, "An Act for rendering valid the Supplementary Award of the Commissioners under an Act of the Fifty-ninth Year of King George the Third, intituled, "An Act for inclosing Lands in the Parish of Alvingham, in the County of Lincoln." The House being moved, "That John Macqueen of Little George Street, Westminster, Gentleman, may be permitted to enter into a Recognizance for James Robertson, on account of his Appeal depending in this House:"
It is Ordered, That the said John Macqueen may enter into a Recognizance for the said Appellant, as desired. 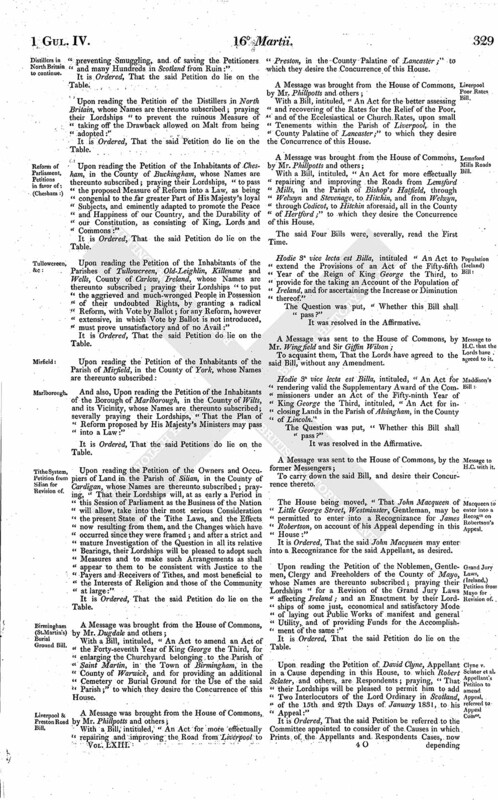 Upon reading the Petition of the Noblemen, Gentlemen, Clergy and Freeholders of the County of Mayo, whose Names are thereunto subscribed; praying their Lordships "for a Revision of the Grand Jury Laws affecting Ireland; and an Enactment by their Lordships of some just, economical and satisfactory Mode of laying out Public Works of manifest and general Utility, and of providing Funds for the Accomplishment of the same:"
Upon reading the Petition of David Clyne, Appellant in a Cause depending in this House, to which Robert Sclater, and others, are Respondents; praying, "That their Lordships will be pleased to permit him to add Two Interlocutors of the Lord Ordinary in Scotland, of the 15th and 27th Days of January 1831, to his Appeal:"
It is Ordered, That the said Petition be referred to the Committee appointed to consider of the Causes in which Prints of the Appellants and Respondents Cases, now depending in this House in Matters of Appeals and Writs of Error, have not been delivered, pursuant to the Standing Orders of this House. The Earl of Shaftesbury reported from the Lords Committees, to whom the Bill, intituled, "An Act for more effectually amending and widening the Road from a Place near the Village of Milford, in the County of Surrey, through Haslemere, to the Forty-third Mile Stone at Carpenter's Heath, and from thence to a Bridge, near the Blue Bell Inn, over Houndley's Water, at the Boundary of the said County of Surrey," was committed; "That they had considered the said Bill, and examined the Allegations thereof, which were found to be true; and that the Committee had gone through the Bill, and directed him to report the same to the House, without any Amendment." Upon reading the Petition and Appeal of William Simson of Cork Street, Burlington Gardens, in the County of Middlesex, Esquire, and Richard Parrott of Cavendish Square, in the same County, Esquire; complaining of a Decree of The Master of the Rolls, of the 15th of February 1831, which Decree was duly inrolled on the 2d Day of March 1831; and praying, "That the same may be reversed, or that the Appellants may have such Relief in the Premises, as to this House, in their Lordships great Wisdom, shall seem meet; and that Jenkin Jones and John William Innes may be required to answer the said Appeal:"
It is Ordered, That the said Jenkin Jones and John William Innes may have a Copy of the said Appeal, and do put in their Answer or respective Answers thereunto, in Writing, on or before Wednesday the 30th Day of this instant March; and Service of this Order upon the Solicitor or Clerk in Court of the said Respondents shall be deemed good Service. Upon reading the Petition of Germain Lavie of Frederick's Place, in the City of London, Gentleman, Agent for Charles Trower Esquire; praying, "That their Lordships will be pleased to dispense with the Attendance of the said Charles Trower upon the Second Reading of the Bill, intituled, "An Act to dissolve the Marriage of Charles Trower Esquire with Amelia Catherine Trower his now Wife, and to enable him to marry again; and for other Purposes therein mentioned," on Friday the 25th Instant, or upon any subsequent Reading or Stage of the said Bill, the said Charles Trower being resident at Calcutta, in the East Indies:"
The Earl of Shaftesbury reported from the Lords Committees, to whom the Bill, intituled, "An Act for amending and maintaining the Turnpike Road from and out of the Road leading from Quebec, in Leeds, to Homefield Lane End, in Wortley, to communicate with the Road leading from Huddersfield to Birstal at the Coach and Horses Public House in Birstal, in the West Riding of the County of York," was committed; That they had considered the said Bill, and examined the Allegations thereof, which were found to be true; and that the Committee had gone through the Bill, and directed him to report the same to the House, without any Amendment." The Earl of Shaftesbury made the like Report from the Lords Committees, to whom the Bill, intituled, "An Act for more effectually repairing and improving the Road from the City of Norwich to North Walsham, in the County of Norfolk," was committed. The Earl of Shaftesbury made the like Report from the Lords Committees, to whom the Bill, intituled, "An Act for more effectually draining certain Fen Lands and Wet Grounds called the Great West Fen, in the Parish of Hilgay, in the County of Norfolk," was committed. The Earl of Shaftesbury made the like Report from the Lords Committees, to whom the Bill, intituled, "An Act for amending and maintaining the Roads from Stafford to Sandon, in the County of Stafford, and from Stafford, through Bridgford and Eccleshall, to Ireland's Cross near Woore, in the County of Salop, and from Bridgford aforesaid to the Stone which divides the Liberty of Ranton and Ellenhall in the Road between Bridg ford and Newport, and from the Village of Knighton to the Turnpike Road leading from Stone to Woore aforesaid," was committed. The Earl of Shaftesbury also made the like Report from the Lords Committees, to whom the Bill, intituled, "An Act for amending and improving the Road from the Town of Stone to Gaol Gate in the Borough of Stafford, and from Green Gate in the said Borough, through Dunston and Penkridge, to Streetway Road, in the Road leading to Wolverhampton, in the County of Stafford," was committed. 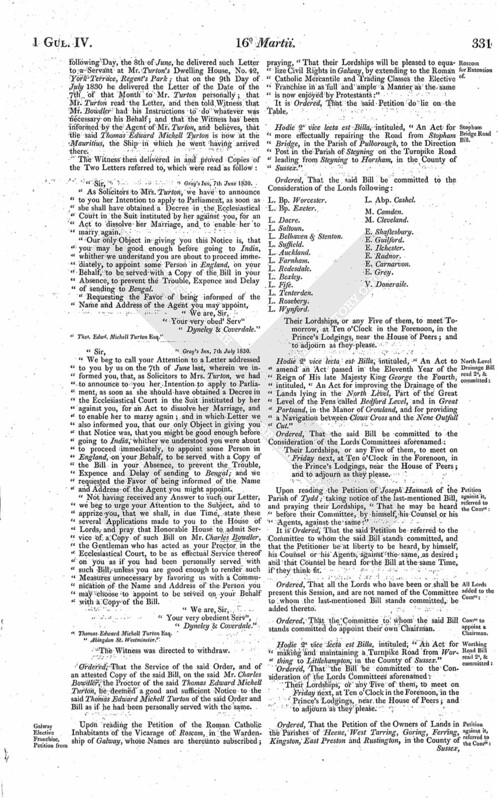 Upon reading the Petition of the Persons whose Names are thereunto subscribed, being Owners of or interested in Steam Vessels plying between the Port of Leith and the Royal Burgh of Stirling; praying their Lordships to refuse their Sanction to the Imposition of such an injurious Tax as that on Passengers conveyed by Steam Vessels:"
And also, Upon reading the Petition of the Inhabitants of Aylesford and its Vicinity, in the County of Kent, whose Names are thereunto subscribed; severally praying, "That their Lordships will be pleased to take the distressed State of the Labouring Poor into their most serious and early Consideration, and repeal the Duty on Malt, a Duty so destructive in its Consequences to the Health and Comfort of more than Half the Population of the United Kingdom:"
Upon reading the Petition of the Inhabitants of the Parish of Ashford, in Kent, whose Names are thereunto subscribed; praying their Lordships "to remove the Penalty of Death for all Offences against Property, and to substitute Punishment better proportioned to the Degree of Crime, better adapted to accomplish its true Object, and better calculated to promote the Interests of Society:"
Upon reading the Petition of the Inhabitants of the Town of Charing, in the County of Kent, whose Names are thereunto subscribed; praying their Lordships "to take the Penal Laws into Consideration, with a view to the Commutation of the Punishment of Death for Crimes against Property unattended with personal Violence:"
A Petition of Louisa Turton, the Wife of Thomas Edward Michell Turton Esquire, was presented and read; praying their Lordships, "That the Service of the Order for the Second Reading of the Bill, intituled, "An Act to dissolve the Marriage of Louisa Turton with Thomas Edward Michell Turton her now Husband, and to enable the said Louisa Turton to marry again; and for other Purposes therein mentioned," and of an attested Copy of the said Bill on Mr. Charles Bowdler, the Proctor of the said Thomas Edward Michell Turton, may be deemed a good and sufficient Notice to the said Thomas Edward Michell Turton of the Order of their Lordships, as if he had been personally served with the same:"
Then John Inskip, Clerk to Messieurs Dyneley, Coverdale and Lee, the Agents for Mrs. Turton, was called in, and having been sworn and examined, proved the Delivery of Two Letters addressed by Messieurs Dyneley and Coverdale to Thomas Edward Michell Turton Esquire; that he endeavoured Twice on the 7th of June to deliver the Letter of that Date to Mr. Turton personally, but could not meet with him; and that on the following Day, the 8th of June, he delivered such Letter to a Servant at Mr. Turton's Dwelling House, No. 42, York Terrace, Regent's Park; that on the 9th Day of July 1830 he delivered the Letter of the Date of the 7th of that Month to Mr. Turton personally; that Mr. Turton read the Letter, and then told Witness that Mr. Bowdler had his Instructions to do whatever was necessary on his Behalf; and that the Witness has been informed by the Agent of Mr. Turton, and believes, that the said Thomas Edward Michell Turton is now at the Mauritius, the Ship in which he went having arrived there. "Sir, "Gray's Inn, 7th June 1830. "As Solicitors to Mrs. Turton, we have to announce to you her Intention to apply to Parliament, as soon as she shall have obtained a Decree in the Ecclesiastical Court in the Suit instituted by her against you, for an Act to dissolve her Marriage, and to enable her to marry again. "Our only Object in giving you this Notice is, that you may be good enough before going to India, whither we understand you are about to proceed immediately, to appoint some Person in England, on your Behalf, to be served with a Copy of the Bill in your Absence, to prevent the Trouble, Expence and Delay of sending to Bengal. "Sir, "Gray's Inn, 7th July 1830. We beg to call your Attention to a Letter addressed to you by us on the 7th of June last, wherein we informed you, that, as Solicitors to Mrs. Turton, we had to announce to you her Intention to apply to Parliament, as soon as she should have obtained a Decree in the Ecclesiastical Court in the Suit instituted by her against you, for an Act to dissolve her Marriage, and to enable her to marry again; and in which Letter we also informed you, that our only Object in giving you that Notice was, that you might be good enough before going to India, whither we understood you were about to proceed immediately, to appoint some Person in England, on your Behalf, to be served with a Copy of the Bill in your Absence, to prevent the Trouble, Expence and Delay of sending to Bengal; and we requested the Favor of being informed of the Name and Address of the Agent you might appoint. "Not having received any Answer to such our Letter, we beg to urge your Attention to the Subject, and to apprize you, that we shall, in due Time, state these several Applications made to you to the House of Lords, and pray that Honorable House to admit Service of a Copy of such Bill on Mr. Charles Bowdler, the Gentleman who has acted as your Proctor in the Ecclesiastical Court, to be as effectual Service thereof on you as if you had been personally served with such Bill, unless you are good enough to render such Measures unnecessary by favoring us with a Communication of the Name and Address of the Person you may choose to appoint to be served on your Behalf with a Copy of the Bill. "Thomas Edward Michell Turton Esq. Ordered, That the Service of the said Order, and of an attested Copy of the said Bill, on the said Mr. Charles Bowdler, the Proctor of the said Thomas Edward Michell Turton, be deemed a good and sufficient Notice to the said Thomas Edward Michell Turton of the said Order and Bill as if he had been personally served with the same. 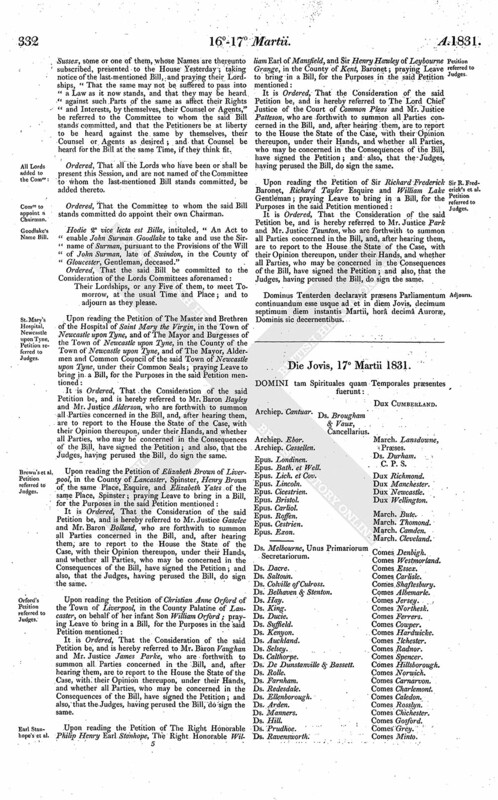 Upon reading the Petition of the Roman Catholic Inhabitants of the Vicarage of Roscom, in the Wardenship of Galway, whose Names are thereunto subscribed; praying, "That their Lordships will be pleased to equalize Civil Rights in Galway, by extending to the Roman Catholic Mercantile and Trading Classes the Elective Franchise in as full and ample a Manner as the same is now enjoyed by Protestants:"
Hodie 2a vice lecta est Billa, intituled, "An Act for more effectually repairing the Road from Stopham Bridge, in the Parish of Pulborough, to the Direction Post in the Parish of Steyning on the Turnpike Road leading from Steyning to Horsham, in the County of Sussex." L. Wynford. L. Abp. Cashel. Hodie 2a vice lecta est Billa, intituled, "An Act to amend an Act passed in the Eleventh Year of the Reign of His late Majesty King George the Fourth, intituled, "An Act for improving the Drainage of the Lands lying in the North Level, Part of the Great Level of the Fens called Bedford Level, and in Great Portsand, in the Manor of Crowland, and for providing a Navigation between Clows Cross and the Nene Outfall Cut." 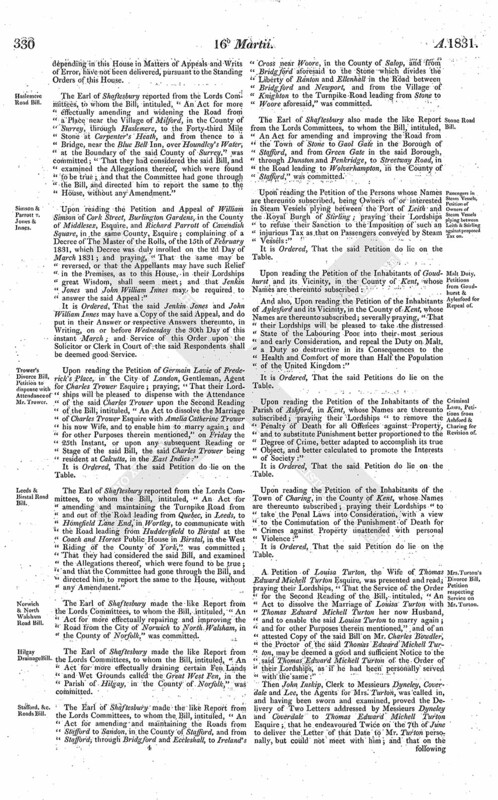 Upon reading the Petition of Joseph Hannath of the Parish of Tydd; taking notice of the last-mentioned Bill, and praying their Lordships, "That he may be heard before their Committee, by himself, his Counsel or his Agents, against the same:"
It is Ordered, That the said Petition be referred to the Committee to whom the said Bill stands committed, and that the Petitioner be at liberty to be heard, by himself, his Counsel or his Agents, against the same, as desired; and that Counsel be heard for the Bill at the same Time, if they think fit. Hodie 2a vice lecta est Billa, intituled, "An Act for making and maintaining a Turnpike Road from Worthing to Littlehampton, in the County of Sussex." 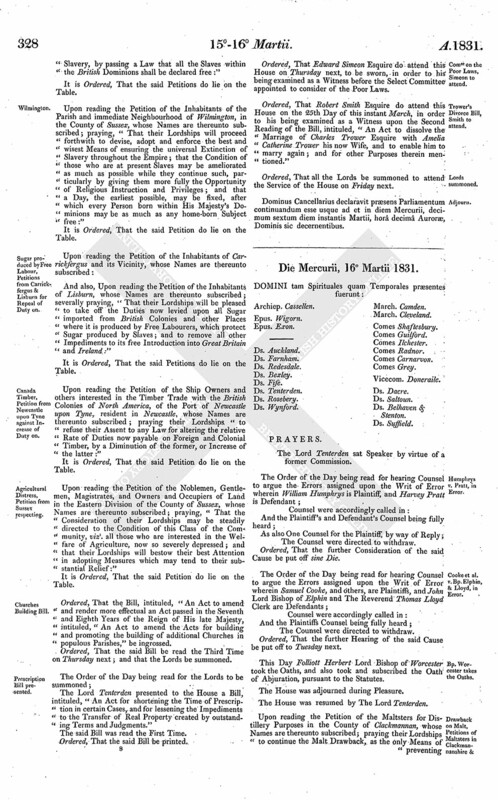 Ordered, That the Petition of the Owners of Lands in the Parishes of Heene, West Tarring, Goring, Ferring, Kingston, East Preston and Rustington, in the County of Sussex, some or one of them, whose Names are thereunto subscribed, presented to the House Yesterday; taking notice of the last mentioned Bill, and praying their Lordships, "That the same may not be suffered to pass into a Law as it now stands, and that they may be heard against such Parts of the same as affect their Rights and Interests, by themselves, their Counsel or Agents," be referred to the Committee to whom the said Bill stands committed, and that the Petitioners be at liberty to be heard against the same by themselves, their Counsel or Agents as desired; and that Counsel be heard for the Bill at the same Time, if they think fit. Hodie 2a vice lecta est Billa, intituled, "An Act to enable John Surman Goodlake to take and use the Sirname of Surman, pursuant to the Provisions of the Will of John Surman, late of Swindon, in the County of Gloucester, Gentleman, deceased." It is Ordered, That the Consideration of the said Petition be, and is hereby referred to Mr. Baron Bayley and Mr. Justice Alderson, who are forthwith to summon all Parties concerned in the Bill, and, after hearing them, are to report to the House the State of the Case, with their Opinion thereupon, under their Hands, and whether all Parties, who may be concerned in the Consequences of the Bill, have signed the Petition; and also, that the Judges, having perused the Bill, do sign the same. It is Ordered, That the Consideration of the said Petition be, and is hereby referred to Mr. Justice Gaselee and Mr. Baron Bolland, who are forthwith to summon all Parties concerned in the Bill, and, after hearing them, are to report to the House the State of the Case, with their Opinion thereupon, under their Hands, and whether all Parties, who may be concerned in the Consequences of the Bill, have signed the Petition; and also, that the Judges, having perused the Bill, do sign the same. It is Ordered, That the Consideration of the said Petition be, and is hereby referred to Mr. Baron Vaughan and Mr. Justice James Parke, who are forthwith to summon all Parties concerned in the Bill, and, after hearing them, are to report to the House the State of the Case, with their Opinion thereupon, under their Hands, and whether all Parties, who may be concerned in the Consequences of the Bill, have signed the Petition; and also, that the Judges, having perused the Bill, do sign the same. It is Ordered, That the Consideration of the said Petition be, and is hereby referred to The Lord Chief Justice of the Court of Common Pleas and Mr. Justice Patteson, who are forthwith to summon all Parties concerned in the Bill, and, after hearing them, are to report to the House the State of the Case, with their Opinion thereupon, under their Hands, and whether all Parties, who may be concerned in the Consequences of the Bill, have signed the Petition; and also, that the Judges, having perused the Bill, do sign the same. It is Ordered, That the Consideration of the said Petition be, and is hereby referred to Mr. Justice Park and Mr. Justice Taunton, who are forthwith to summon all Parties concerned in the Bill, and, after hearing them, are to report to the House the State of the Case, with their Opinion thereupon, under their Hands, and whether all Parties, who may be concerned in the Consequences of the Bill, have signed the Petition; and also, that the Judges, having perused the Bill, do sign the same. Dominus Tenterden declaravit præsens Parliamentum continuandum esse usque ad et in diem Jovis, decimum septimum diem instantis Martii, horâ decimâ Auroræ, Dominis sic decernentibus.